Greetings, people of earth! (Apologies, it’s 2AM and I’m only posting because sleep is eluding me.) I wanted to make a wee follow-up post and say that the Japanese Cinema Blogathon for disaster relief has now drawn to a close, with 63 posts contributed, five of them (or 8% if you’re counting) coming from me. I hope our united efforts to spotlight the work of Japanese filmmakers inspired you to dig a little deeper and cough up some more dough for Japan, which could really use the help right now. I did notice that, in my five days of marathon posting, not a single person clicked on my link to Mollybot’s fantastic fundraiser for Animal Refuge Kansai, where she was giving out adorable free animal paintings left and right, all for the low low cost of a ¥1000 ($13) donation to this deserving Japanese animal rescue organization. (What, you didn’t think I’d notice? Two words: site stats, baby!) Well, the joke’s on you, because even without your help, she has now raised an astounding ¥66,000 for ARK. That’s over $800!!! I have experienced firsthand Molly’s grass-roots effort to raise these funds – hey, I do live with her – and she has been painting herself into a coma over here, with zero help from me, who is hopelessly talentless in that department. Sadly, we’re running low on paint and pretty maps of Japan, so if you still want a painting, get your donation in quick, because she’s capping it at 50 and she’s already done 46. Fortunately, plans are in the works to start another round of art-for-donations, this time with bigger custom paintings for a higher premium. Believe me, it’s definitely worth it for this caliber of work. Even I’dpay for these paintings, and I can get them for free. Synopsis: Shy and awkward Haru Yoshioka feels like she never does anything right. She can never wake up in time for school and is always tripping over things. When Haru performs a good deed by saving a cat from getting hit by a truck, the animal responds by thankingher and promising to repay her kindness! Soon Haru is getting all kinds of gifts from the Kingdom of Cats, including cattails in her garden (which make her sneeze) and live mice in her locker (which make her squeamish)! Haru regrets helping the cat, because now his brethren won’t leave her alone. But things really turn serious when the Cat King decides to bestow upon Haru what he views to be the ultimate gift: the hand of his son, the prince, in marriage! Desperate to avoid being taken to the Cat Kingdom and turned into a cat forever, Haru seeks the help of the Baron, a dapper kitty in a formal suit, along with his fat and grumpy friend Muta and a crow named Toto. But before her new friends can stop them, representatives of the Cat Kingdom come and steal Haru away in the night. Can Haru find her way out of the Kingdom before she’s completely and permanently transformed? This is an official entry in the week-long Japanese Cinema Blogathon for disaster relief, co-hosted by CinemaFanatic and Japan Cinema. As we all know, Japan was struck with a 9.0 earthquake on March 11, resulting in devastating tsunamis and widespread destruction. Please CLICK HERE to make a donation to the represented charity of your choice to aid Japanese disaster victims, and be sure to click the banner at left to view the other contributions to the blogathon. 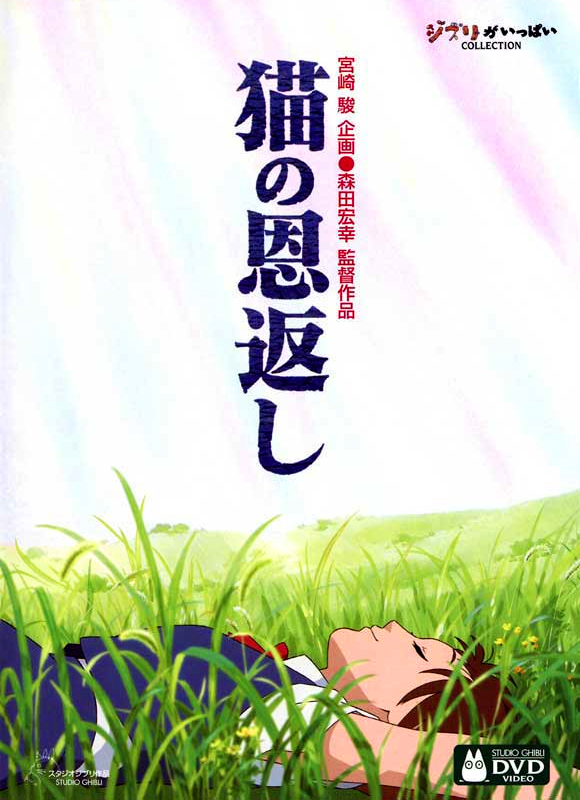 Synopsis: Junior high school student Shizuku Tsukishima finds her life becoming increasingly mysterious when she notices that the same person is checking out every book in the library she reads – beforeshe reads them. Putting aside this conundrum, she attempts to write a song for her school’s graduation ceremony; but when she forgets her notebook on a bench and returns to find a strange boy reading it, who then labels her lyrics “corny,” she feels discouraged. Riding the train one day, she notices a cat on board, seemingly traveling all by itself. Following the animal out of the station, Shizuku discovers a magical antique shop which awakens her creative spirit. She meets the owner, a kindly old man – and his grandson, who just so happens to be the same boy who insulted her song! 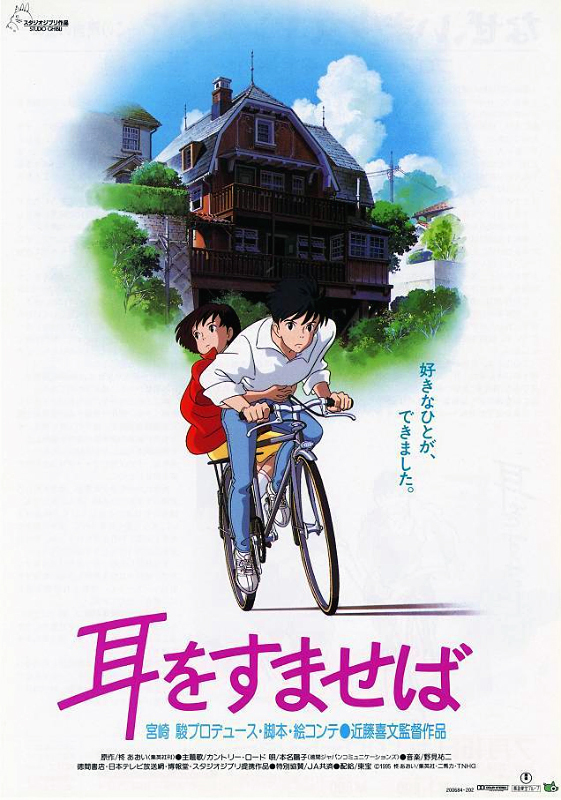 Learning that the boy, Seiji, plans to skip high school to go to Italy and train as a violin-maker, Shizuku begins to question whether she truly has what it takes to realize her dream of becoming a writer. Can Shizuku find happiness within herself, before it’s too late to find it with someone else? Synopsis: On the edge of the forest of the Tokyo suburbs, a clan of wild raccoon-dogs (known in Japanese as tanuki) feel their habitat being increasingly encroached upon by the construction of human dwellings. Realizing that they will soon run out of food and places to raise their families, the good-natured but concerned tanuki band together to find a way to drive the humans out of their territory. 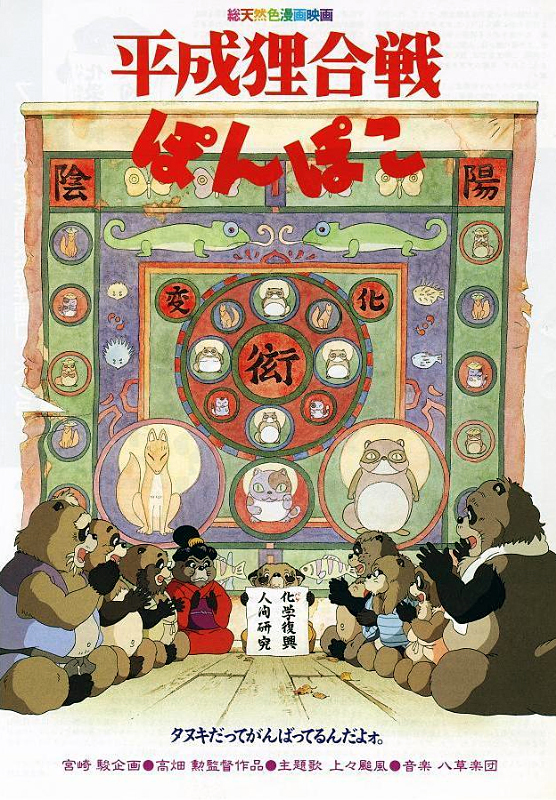 Summoning their long-forgotten powers of shape-shifting and transformation, the tanuki begin a guerrilla campaign to scare the humans away by impersonating every deity, demon and ghost under the sun. But when it soon becomes clear that the humans won’t be chased off that easily, a militant male by the name of Gonta lobbies for more violent tactics to rid the tanuki of the human presence. Can the wise elders Tsurugame and Oruku and the rest of the clan stop Gonta and his militia before they get themselves killed? Or is resorting to violence really the animals’ last plausible hope for peace? 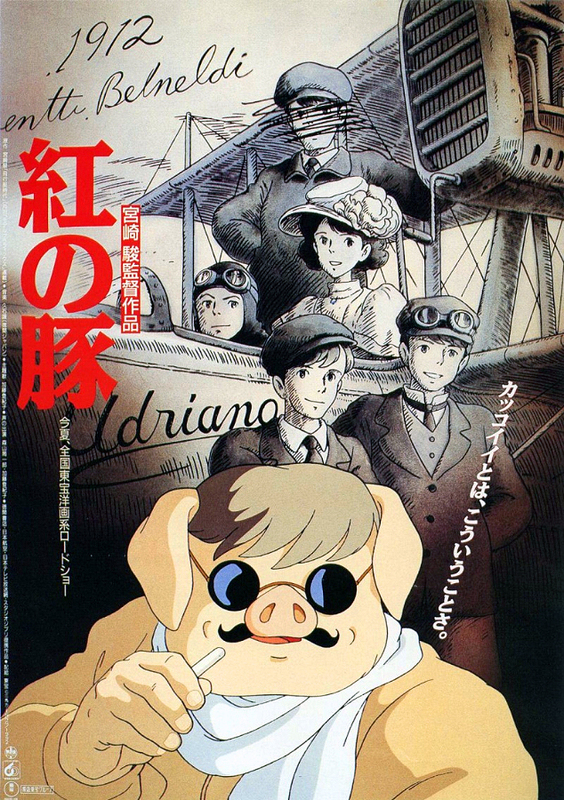 Synopsis: Trained as an ace fighter pilot for the Italian Air Force during World War I, pig-headed (literally) Porco Rosso now answers to no one but himself – and anyone with enough cash to hire his services as a bounty hunter, of course. He maintains a friendly rivalry with the local “air pirates,” bandits in sea planes who swipe their booty from passing ships. Instead of joining their band of merry thieves, Porco makes his money stealing backtheir plunder on behalf of the victims! Yet after dark they always put their differences aside and come together to share a drink at the bar of the Hotel Adriano, owned by the lovely and tragic Gina. But when hotshot American pilot Curtis arrives on the scene, he makes it his mission to take down the meddlesome Porco once and for all. With the help of his immature yet skilled mechanic and co-pilot Fio, can Porco defeat Curtis in the ultimate dogfight – and finally win the affections of the beautiful Gina?